The domain BF4.com sold for $550 in 2008 on the NamePros.com forum and was held by that buyer until early this year (2013) until a whois records change on 2/26/2013 to a Gary Warne of Australia. That is my educated guess as to when "EA" purchased it. 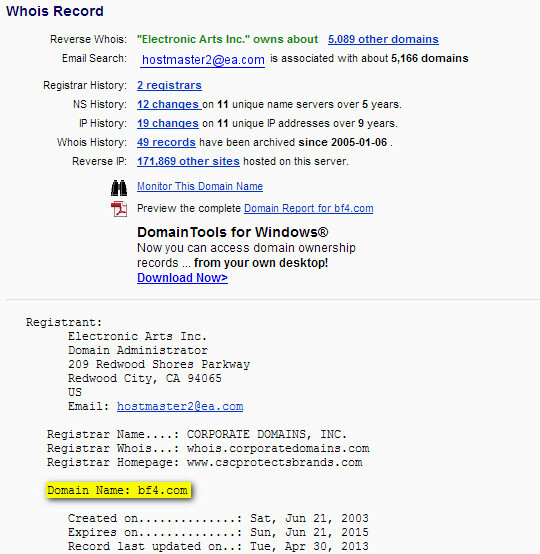 As of yesterday (4/29/2013) the whois records updated to Electronic Arts Inc. as the owners. At this time I wasn't able to dig up the price paid by EA for BF4.com, but I would think it was more than the $550 paid in 2008.